Several critics have called R.E.M. the American version of U2 because of each band's timeliness, relative cohesion, and longevity. I would add one more element to that comparison: each band's recent mid-life crisis. Like R.E.M., U2 began their careers with angry, energetic anthems that spoke to the social and cultural incongruities of the Reagan-Bush-Thatcher-Major era. However, both bands ended the century with bland techno flash, trading in their steel guitar talent for fiberglass drum machines. With their latest release, U2 may have finally broken that ugly cycle. This new album is leaner and meaner than anything they've done in nearly ten years, if not as politically daring as earlier works. It seems to pick up where Achtung Baby left off. I saw their performance on Saturday Night Live this fall and was not surprised when many called it the best live performance SNL's ever had. Like the album, that performance had a mission and message: U2 has come out of pop-hibernation to offer music for adults. It is a serious exploration of quiet guitar strings and wise resolutions. The Edge's bagpipe-riffs can be heard-gently, in the background-while Brian Eno directs tight synthesizer melodies. 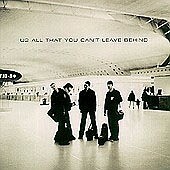 These quiet moments build to complex mixtures of the old and the new in the development of U2. The album does have a few drawbacks: the lyrics are a bit too reflective at times, lapsing into self-indulgent sap and missing the great commentary of albums like Unforgettable Fire. Also, the collection lacks that one heart-splitting, vocal-heavy ballad (One, Pride (In The Name Of Love), etc.) so effective on earlier albums. Although U2 are perhaps too wise, if not too old, to convey the urgency of New Year's Day, this offering is certainly a none-too-soon return to the past. Let's hope that R.E.M. takes the hint.